The Louisiana Tech University College of Engineering and Science is pleased to announce its 2019 Outstanding Juniors, Seniors and Faculty. During the Spring Quarter of each year, College of Engineering and Science (COES) faculty select outstanding juniors and seniors, and students vote on their favorite faculty members. Winners are announced at the College’s annual Spring Release celebration. This year, students voted Dr. Eric Sherer, associate professor of chemical engineering and molecular science and nanotechnology, and Dr. Brad Cicciarelli, senior lecturer of chemical engineering, as Outstanding Faculty for the year. The College has named 13 juniors and 11 seniors as outstanding students for the 2018-19 academic year. Faculty selected Joe Bingham, cyber engineering, Andrew Brown, chemistry, Savannah Esteve, biomedical engineering, Tyler Fontenot, electrical engineering, Jason Haddad, biomedical engineering, Luke Hansen, mechanical engineering, Alyse Jones, electrical engineering, Sammy Monk, industrial engineering, Anna Katya Opel, civil engineering, Ashley Riddick, chemical engineering, Ryan Schaefer, mechanical engineering, Leann Tengowski, biomedical engineering, and Luke Seaton, mathematics, as Outstanding Juniors. Outstanding Seniors are George Cazenavette, cyber engineering and computer science, Jenny Cox, mathematics, Austin Dugas, mechanical engineering, Jacob Fontenot, mechanical engineering and modern languages – Spanish, Rachel Hegab, biomedical engineering, Natalie Mueller, biomedical engineering, Cassie Oliver, chemical engineering, Madison Padgett, biomedical engineering, Marshall Schoth, mechanical engineering, Rachel Shumate, mechanical engineering, and Eboni Williams, chemistry and computer science. Louisiana Tech Tau Beta Pi also selected Max Broussard, mechanical engineering, as the Freshman Engineer of the Year and announced the award at Spring Release. 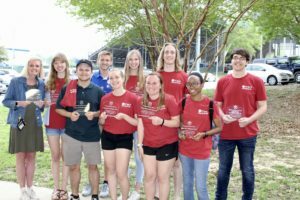 The Engineering and Science Association awarded the American Society of Civil Engineers first place in the COES Cup competition, the Biomedical Engineering Society second place, and the Society of Women Engineers third place at the same event for their academic and outreach activities during the year.